H. V. Kell was a a grocery-hardware store chain. The stenciled advertising placed diagonally between the windows was very common in the late-19th and early-20th centuries, but is rarely seen intact today. The banners read, from left to right: Farm Hardware; Field Fence; Roofing Nails; Paints And Oil. Fort Valley was a real surprise, as I’d only passed through the area briefly before my recent photo expedition there. There are three National Register Historic Districts in the town and one of the most interesting and well maintained downtowns I’ve seen in awhile. It’s a bit out of the way, but definitely worth a trip whether you’re a photographer, historian, or casual visitor. 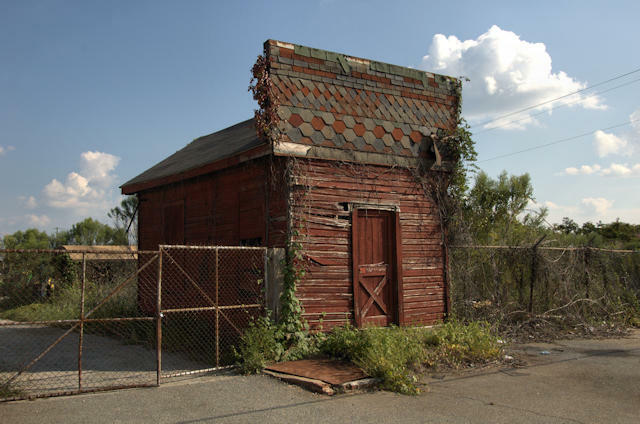 This outbuilding is located at the Anthoine Machine Shop along Railroad Street. 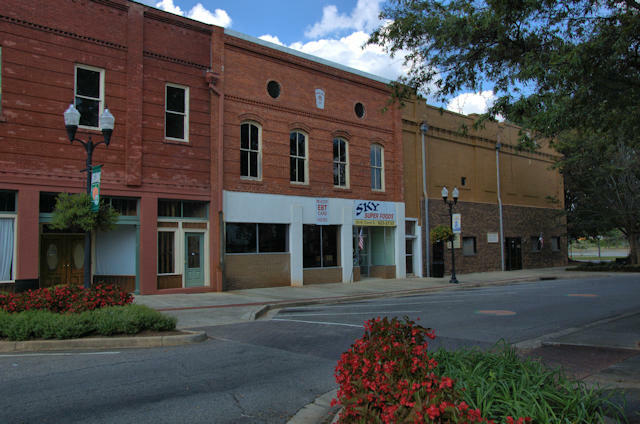 Established in 1885, the Anthoine Machine Shop is the second oldest business in Peach County and is one of just a few machine shops still using line shafts in Georgia. Vanishing icons of the Industrial Revolution, line shafts were the common mode of power transmission in machinery until the widespread availability of small motors deemed them unnecessary. The building in the middle is the Fort Valley Masonic Lodge #110, F. & A. M.
Designed by Dennis & Dennis, this is likely a WPA construction, but I haven’t confirmed this. Peach County, Georgia’s newest, was created in 1924. This jail was built soon thereafter and for many years housed the sheriff’s family (first floor) along with inmates on the second floor. The jail was decommissioned in 1986. As of 2016, it is slated for demolition. It may already be gone. I first thought this to be a WPA construction, but the 1932 date is a bit early for that. 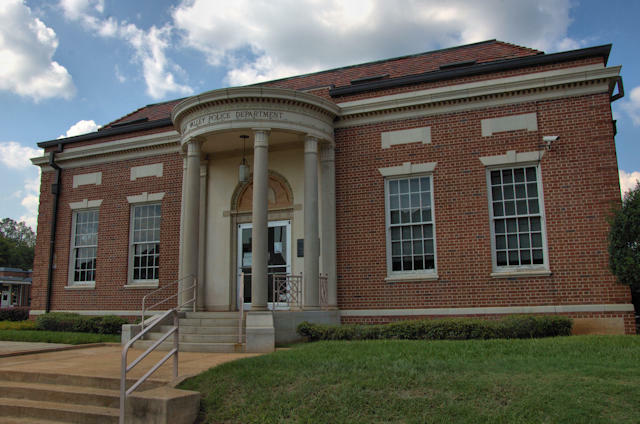 It was orginally built as a post office and is very similar to many WPA-era post offices. 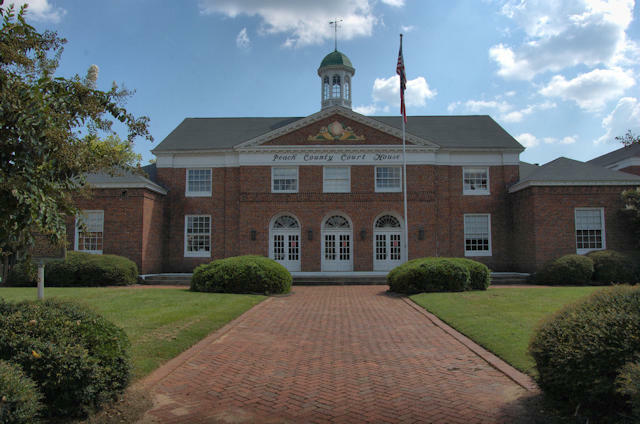 J. L. Fincher, a jeweler by trade, was twice mayor of Fort Valley. This was the first house to be electrified in Fort Valley. 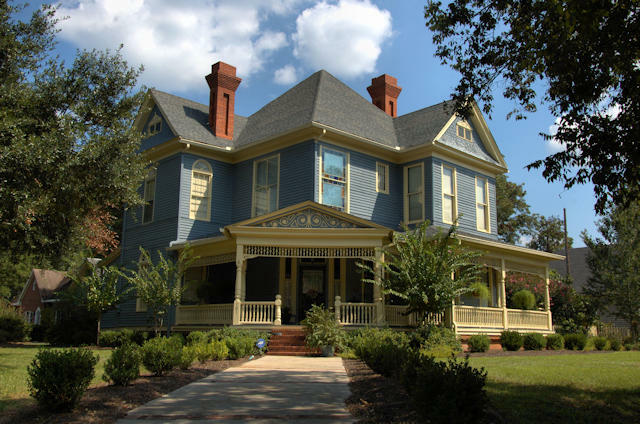 It is also known as the Adamson House. 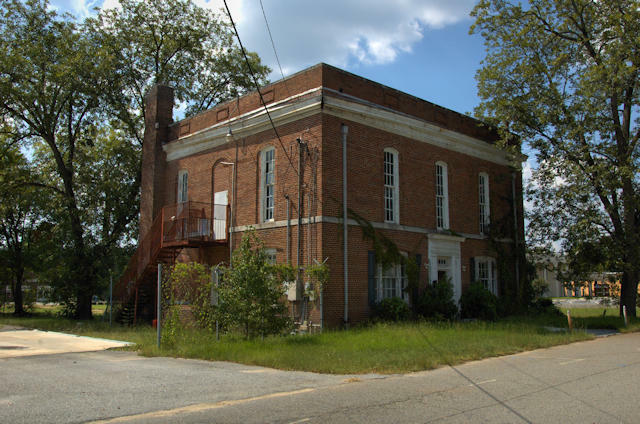 Most of the background information for this and other structures in Fort Valley come from the publication, The Historic Architecture of Fort Valley: A Walking-Driving Guide, Third Edition, © 2009, The Peach County Historical Society. Every community such be so lucky as to have such a useful guide.